Sashiko or more properly sash(i)ko as the ‘i’ is barely pronounced, is the term for Japanese embroidery where intricate, typically geometric, designs are made using running stitch, commonly using white stitches on indigo fabric. The contrast between the blue and white works well although other colours are also used. The white stitches on a dark background are meant to represent snow on the ground in the dark, cold months of winter when sashiko stitching was the main indoor activity for Japanese women in rural northern Japan. According to textile historian Cynthia Shaver, the earliest recorded appearance of purely aesthetic sashiko-stitching was in the eighth-century and was found on a monk’s robe although it became more established during the Edo period (1615-1868) as a domestic rural craft. At the time fabric was precious as it has to be hand spun, hand woven and hand dyed using bast fibres such as linen, hemp and ramie, all very labour intensive processes. Indigo was popular as it dyed to a dark colour and had insect repellent and fire-retardant properties, which is why it was used traditionally to dye fireman’s jackets. Sashiko started life as a means to repair and strengthen old clothes and was characterised by stitching rows of stitch across fabric to stitch it together and prolong the life of the garment, typically because, at the time, fabric was very scarce in Japan and the poor had to conserve every scrap they had. These repairs soon turned into patterns, presumably because the stitchers wanted to make a dull necessity more interesting and beautiful. Skill in sashiko was considered a key skill for young women wanting to make a good marriage and was taught at village needlework schools during the winter months when people had to spend a lot of time indoors. 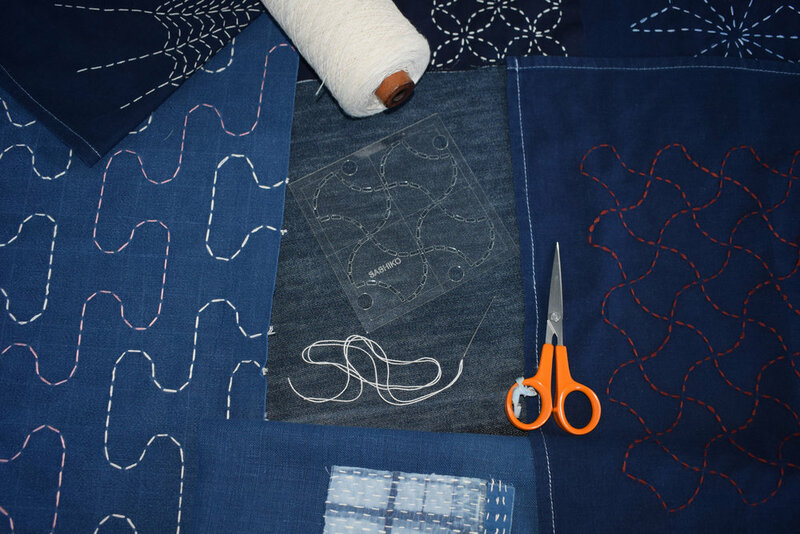 Sashiko means ‘little stab’ or ‘little pierce’, derived from the Japanese verb “sasu,” and describes the stitching action where a number of stitches are taken at once. The needle is dipped or “stabbed” in and out of the fabric, collecting small gathers on the needle which, when pulled through the cloth, create a line of stitches in one go. A crucial element of sashiko is stitch consistency and, depending on region, this could vary from five to ten stitches per inch. This, of course, requires a steady hand and an immense amount of skill, something that Japanese artisans honed mainly during the winter months. Old sashiko methods typically combined several layers of fabric to make it stronger, with the best cloth on top although it can be stitched on a single layer of cloth or with quilting or batting in between two layers to make a quilt or throw. The stitches made form a texture as well so there is a three-dimensionality to the fabrics made using the technique as well as its surface beauty. Moyozashi, (pattern sashiko) which features repeating geometric shapes made up of straight, curved and zigzag lines, typically drawn using a grid as a guide and definition of scale. The grid dimensions can vary according to the pattern and can be adjusted to change the overall size and scale of the design. Hitomezashi (one stitch sashiko) which is made up only of a series of horizontal and vertical lines which may or may not touch to form bordered shapes. Curves do not feature in these patterns although diagonals may. The simplest form or rows of running stitch was often used for repairs in garments. NOTE: Unlike Moyozashi patterns threads often intersect and cross each other as part of the design. These designs tend to be more densely stitched than Moyozashi patterns. The two types can be combined in a single piece of work to great effect. Sashiko designs can be transferred onto fabric using a number of techniques, including with drawn grids using chalk pencil, templates, chaco paper (paper with a chalk backing that can be placed over work and the pattern drawn on with a plastic tool or blunt pencil). You can even get special paper you can put through the printer and stick to your fabric that you stitch through and remove afterwards. Each technique has its advantages and disadvantages! 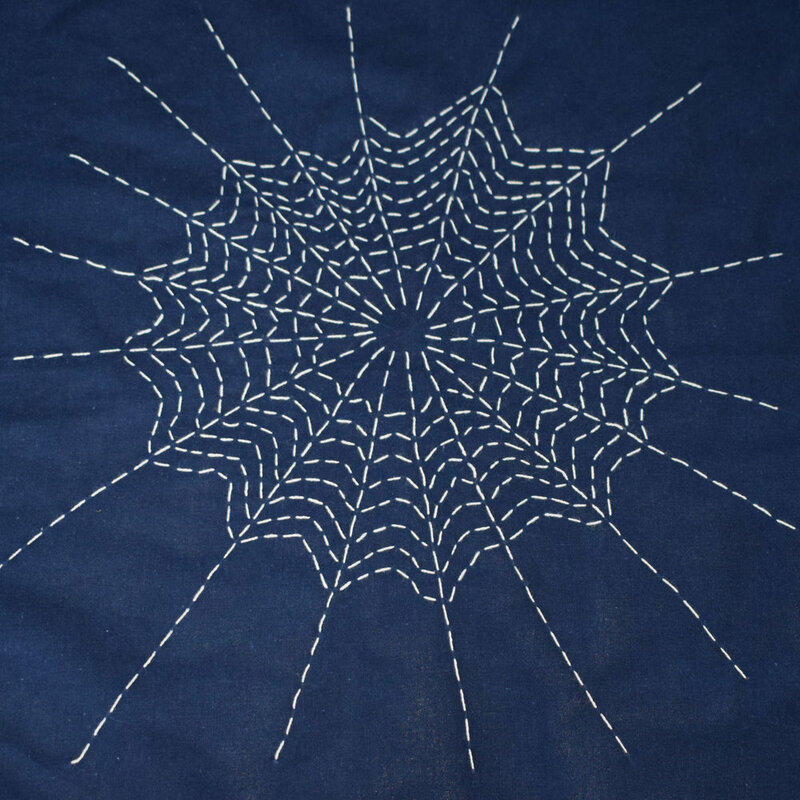 And, of course, you can take the principles of sashiko stitching and make up your own designs like this spiderweb pattern I made. 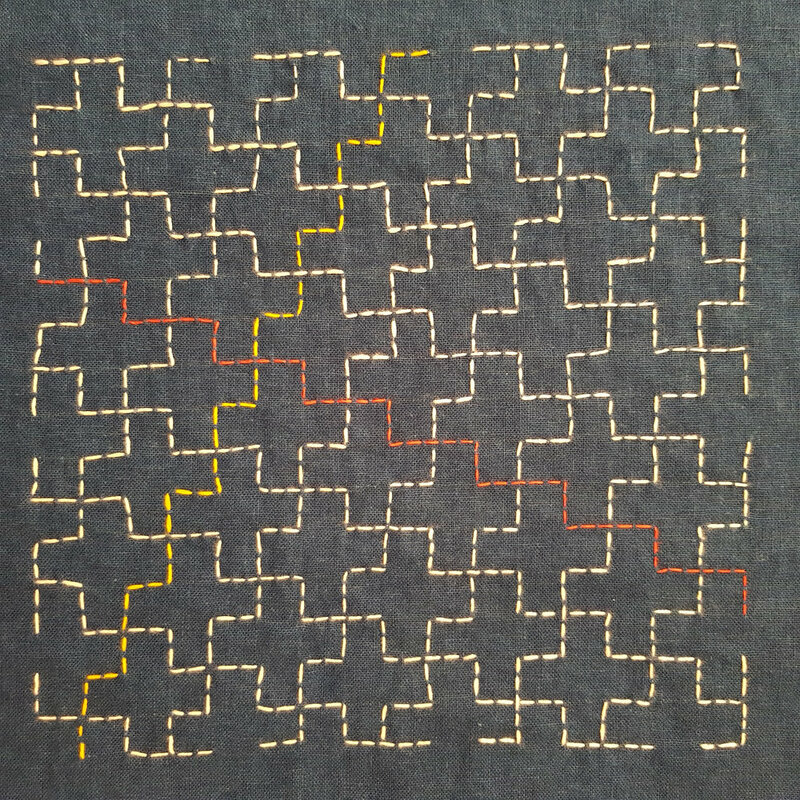 Sashiko stitching itself works best if the stitches are an even size and the disctinctive crisp, even finish is achieved by leaving gaps between stitches of around a third the size of the stitch itself. Care must also be taken at intersections and corners. In Myozashi sashiko patterns stitches never touch and the gaps are made to line up and look beautiful. If this post has sparked your interest and you’d like to to some Sashiko stitch yourself come to one of my classes. You’ll get an indigo dyed hankie to work on, all tools and materials included.